The first in a series of three prints celebrating the historic moon mission was just released and quickly sold out. Paper Money Guaranty® (PMG®) is offering an encapsulation service for the Apollo 11 engraved prints made by the US Bureau of Engraving and Printing (BEP) to celebrate the 1969 mission that accomplished the first manned moon landing. Three 8.5” x 11” Apollo 11 prints will be made by the BEP and sold by the US Mint (which now handles BEP’s retail sales). The first print, which was limited to 8,000 pieces, sold out soon after it was offered on January 24. 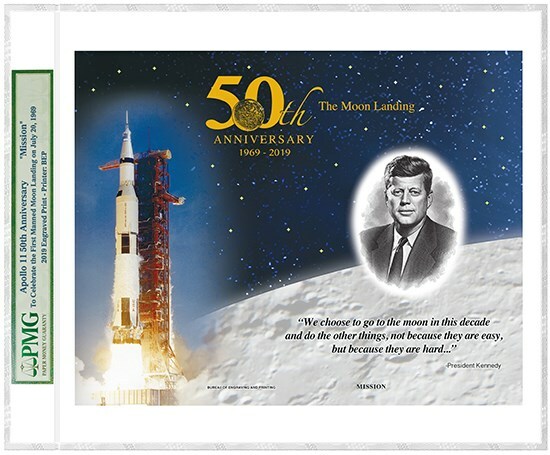 It features an engraving of President John F. Kennedy above his famous "We choose to go to the moon" quote from September 1962. To the left of Kennedy is an embossing of the Apollo 11 rocket that realized his vision less than seven years later. The second and third prints will be released later in 2019, with quotes from Neil Armstrong and President Nixon highlighting the enormous significance of the Apollo 11 mission. Submit these prints to PMG for authentication and encapsulation on their own submission form and write "BEP" at the top. Submitters can skip boxes 5 to 8 and enter the $30 fee per print on line 1 of box 10. Questions? Contact PMG Customer Service at Service@PMGnotes.com or 1-877-764-5570.